Millions of Americans love to grill – and yet the popular practice can be deeply unhealthy. As the barbecue season of summer approaches, the experts at the American Institute for Cancer Research (AICR), a non-profit research and education organization, tell you what you need to know about the issue. There is no clear research showing that grilling links to cancer risk. But cooking meats at high temperatures, such as grilling, can lead to two main types of potential carcinogens. Polycyclic aromatic hydrocarbons (PAHs), found in smoke, can adhere to the meat on an open fire. Heterocyclic amines (HCAs) form in meat when the meat proteins react to the intense heat of the grill. Research is clear that diets high in red meat increase risk of colorectal cancer. Even small amounts of processed meats, eaten regularly, increase risk for both colorectal and stomach cancers. Based on this evidence, AICR recommends limiting red meat to no more than18 ounces of cooked meat per week and avoiding hot dogs and other processed meats (bacon, sausages, etc.). Shorten Grilling Time, Precook or Cut It Up: If you are grilling larger cuts, you can reduce the time your meat is exposed to the flames by partially cooking it in a microwave, oven or stove first. Immediately place the partially cooked meat on the preheated grill to keep your meat safe from bacteria and other food pathogens. You can also cut your meat into smaller portions before grilling. Trim the Fat: Trimming the fat off your meat can reduce flare-ups and charring. Cook your meat in the center of the grill moving coals to the outside, and make sure to flip frequently. 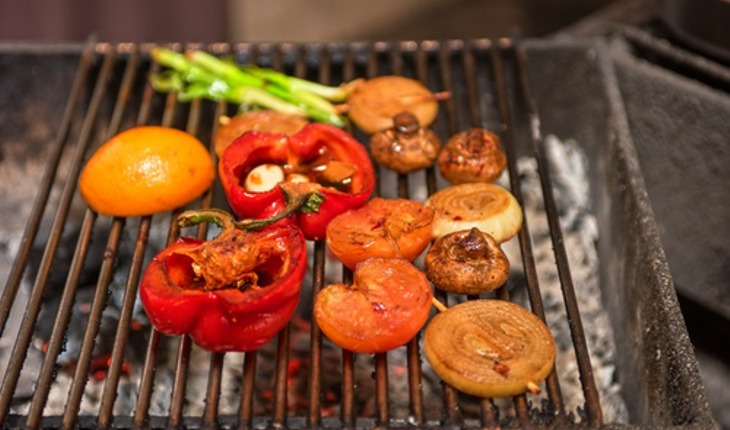 Grill Plants: Grilled vegetables and fruits produce no HCAs, and diets high in plant foods are associated with lower cancer risk.